Before the canned tuna gets on your plate it’s a wild tuna that must be caught. Improper fishing and mass harvesting techniques can lead to the depletion of fish stocks and in some cases environmental degradation (such as dredging and use of explosives). Therefore, it is important for consumers to ensure that their tuna fish comes from certified sustainable fisheries and to understand how tuna fish are caught. There are many ways to catch a tuna, however, here we will explore the four most popular methods. The methods below are listed in order of most sustainable and ecologically friendly to least. Tuna pole and line fishing uses hand-held poles to catch the fish. It is a solid reel-less pole with a short line attached to the end with a baited or lured hook that can easily release the fish for quick turnaround time. When fishermen find a tuna school they will use a form of bait to coax them to the surface and begin fishing from the boat. When the fish bite they will manually bring them out of the water and release them on the boat before quickly returning to the water to continue fishing. This type of tuna fishing targets only the subject species and results in the least amount of bycatch. A trolling boat has multiple outriggers, poles and lines attached that use lures dragged across the ocean surface at a speed of about 4-7 miles per hour. Large beefy hooks are used with special durable lures that allow a fisherman to easily unhook the tuna. When a tuna is caught the fish are quickly reeled in and the line is put back in the ocean. The boat will usually make slow wide circles while it trolls. With longline fishing, a rope is set out that may run for several miles below the ocean. This line will have other short lines attached to it with baited hooks to catch the tuna. These lines will have different lengths and will be propped up by floats and other lines to maintain proper depth. 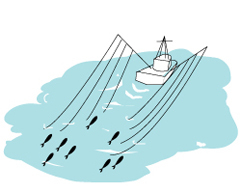 The tuna fish are retrieved by winding up the main line and removing any caught fish from the hooks. Then the line is set again and the process continues. Many other species of fish other than tuna may be caught using this method and then discarded as bycatch. This can include turtles, swordfish and sharks and they will typically die underwater due to the length of time spent on the hook. 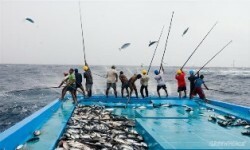 This type of fishing uses a huge net that is hauled by a large factory ship. When a school of tuna is located smaller ships help deploy the giant net from the main ship in a circular pattern around the tuna. Once the tuna are encircled with the net the main ship retrieves the fishing net and a rope named a purse line is pulled in through net rings. 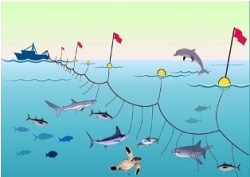 This tightens the net, closes the bottom and catches the fish at which point the net is pulled back onto the boat and the tuna fish and bycatch are unloaded. This type of fishing is quite indiscriminate and any other fish surrounding the tuna are also caught and typically thrown overboard as bycatch. Previously this resulted in the deaths of many dolphins as the fisherman used the dolphins to find the tuna then surrounded the tuna school with the purse net. However with the advent of FAD’s (fish aggregation devices) many other species of marine life are now caught in these nets. This includes turtles, sharks, large predator fish and even young tuna that are too small to keep. Tuna purse seine fishing and FAD’s have become a major problem and it is recommended to avoid tuna caught this way as it is generally thought to be a highly unsustainable tuna fishing method.